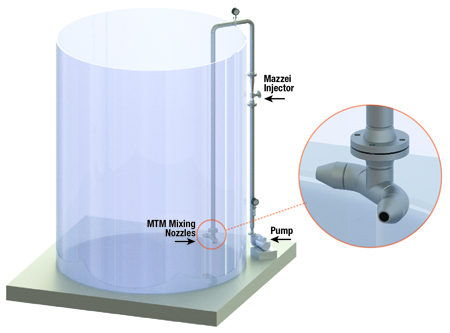 Mazzei MTM mixing nozzles provide dynamic mixing under pressure, which results in great mass transfer. When used in conjunction with the patented Mazzei® injector, these nozzles dramatically enhance system mixing and contacting performance. Mazzei nozzles allow the delivery of treatment gases to any depth—all within a compact design, with trouble-free operation and easy installation. Many models are available for various applications. 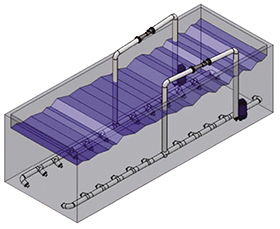 Venturi wastewater aeration systems are the efficient, low cost, quiet solution for wastewater problems. Wastewater is circulated through Mazzei injectors creating a vacuum to draw air into the wastewater. The aerated process water is discharged back into the tank, basin, pond or lagoon through a nozzle manifold for additional oxygen transfer and mixing. Mazzei aeration runs on low operating pressure, has low installation cost and has no maximum depth limitations. CLICK ON THE NOZZLE MODEL NUMBER IN THE TABLE BELOW. You will need Adobe Acrobat Reader to view the individual graphs. *Differential pressure is the difference between the inlet and outlet pressures.